A nation divided in wartime invites its own defeat. Yet that is precisely how America is facing the global war on terror. 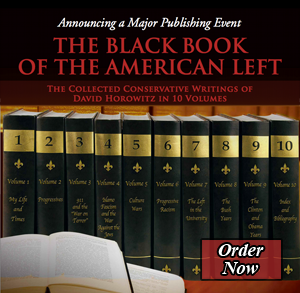 In a brutally honest assessment , David Horowitz and Ben Johnson show that the American left, led by the Democratic Party, is waging a ferocious political war against its own government that has left our country more seriously divided than at any other time since the Civil War. And the consequences could be dangerous. In the fight against Islamic terrorists, America faces perennial questions that have become suddenly urgent: What is legitimate criticism of military policy in wartime? When does criticism cross the line and undermine the national interest? Democrats now routinely cross that line, Horowitz and Johnson show. Their candid and explosive book forces us to confront the consequences of these unprecendented attacks on the US war effort. David Horowitz speaks on Party of Defeat at the National Press Club.